This band was the subject of my Opus 1; the first published piece that I’d wish to acknowledge. Memphis Shakedown, The Memphis Jug Band on Record (in Blues-Link issue 2, 1973), has the earnest pedantry and the naive enthusiasm of youth, and if the years have done no more than remove the adjectives from the nouns, that will be enough for me. On the other hand, I did pick a good subject. Don Kent and Bengt Olsson begin their notes with the sweeping assertion that ‘The Memphis Jug Band is not only the greatest jug band ever recorded, but is the greatest representative of traditional music of its time and place, crossing all boundaries.’ The first of these claims is marketing rather than scholarship; I wouldn’t argue the MJB’s greatness, but for me, relative positions on the ladder depend on what I’m looking for at any particular time. Gus Cannon’s Jug Stompers found emotional depths in the blues that the MJB never quite plumbed; if there’s a more moving jug band performance than their Viola Lee Blues, I’ve yet to hear it. The Louisville bands led by Earl McDonald and Clifford Hayes achieve at their best an extraordinary blend of sophisticated jazz and pungent alley music. Among less extensively recorded outfits, the raucous Birmingham Jug Band, the crazily exuberant Jed Davenport’s Beale Street Jug Band, and Jack Kelly’s violin-led South Memphis Jug Band all have unique merits of their own, but I’m in danger of straying too far from the record at hand. What about ‘the greatest representative of traditional music of its time and place’? It depends, I suppose, on what you mean by greatness. Kent and Olsson base their view on the breadth of the MJB’s repertoire, and the assurance with which they handled it, and it’s actually rather hard to argue with that. If they never achieve the magnificent artistry of a Robert Johnson or a Blind Willie McTell, they certainly tackle blues, pop, rags, breakdowns, waltzes, blues-ballads and songster material with equal assurance. But an extensive repertoire means nothing without an appealing delivery, both artistically and commercially. The Memphis Jug Band’s long association with RCA Victor (1927 to 1930) was largely down to the talent spotting, organising and rehearsing skills of the band’s leader and business manager, Will Shade. In Shade, Victor’s Ralph Peer clearly recognised a man who could be relied on to round up the available musicians and bring them along, usually to the temporary studios which Victor set up on their field trips to Memphis, but occasionally on the train ride to Atlanta or Chicago. Shade’s collaboration with Peer seems to have extended into general talent scouting, and even co-production ‘Mr Peer and Will Shade present,’ the Victor logs sometimes note, the presence and absence of an honorific neatly encapsulating the racial attitudes of the time. 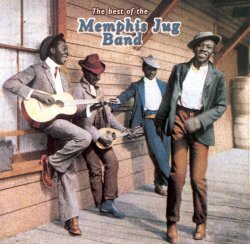 The Best Of The Memphis Jug Band is, of course, really some of the best of the Memphis Jug Band; it would be perfectly possible to compile another CD, almost as good, with 23 different tracks - Sun Brimmers Blues, Jug Band Waltz, Lindbergh Hop - well, you get the idea. There is, indeed, a double CD currently available on Classic Blues, retailing for a tenner or so, and with good sound. It does not, however, have Yazoo’s quality annotation and discographical details. Equally, Frog’s three ‘complete in chrono’ discs are available for those who want to hear it all, and benefit from the remastering skills of John R T Davies. For those who must have everything, there are four volumes on Document (with notes by the present writer), and a collection of ‘associates and alternate takes ’ on Wolf, which is far from the barrel-scraping exercise you might expect. Spoilt for choice of Memphis Jug Band reissues - that can’t be bad! Yazoo’s collection is a very good one; my only complaint is that the cover photograph has been ineptly colorised, and thereby robbed of its historical context, and its artistic and iconic power. It appears to be nature’s law, however, that people will not buy records with black and white covers. Go figure!